Rickenbacker International Corporation - Forum • View topic - No Tension! 2008 360/6, owned only for a few weeks. Noticed a little twist in the neck, intonation out on the G so I thought I would give adjusting it a whirl. Took off the cover and noticed that the length of exposed rods were different. Checking near the base and I saw one sitting in the neck higher. Oh well! To my surprize the nuts were only making contact, no tension. Adjusted it so that there was about a mm at the 7th fret, 6 & 1. Some kind of buzzing around the 5th thru 8th fret on the top 4 strings in the playing position, I can't tell where it's coming from. Having a real tough time getting the intonation on the G, but I'll replace strings and try it again. But what is the consensus on the no tension thing? Is this a job a superman should take over? Post subject: Re: No Tension! Here are a few pics. Hope they display. ...Noticed a little twist in the neck, intonation out on the G so I thought I would give adjusting it a whirl......Having a real tough time getting the intonation on the G, but I'll replace strings and try it again. If the neck relief set to your needs, with no tension on the truss rods, then all is good. Now, adjusting for intonation is a different thing (although relief will have a small effect on intonation). After the relief is to your liking then you need to adjust the bridge saddles to intonate the instrument. Thanks jps, I should have posted that I adjusted the intonation with the saddles and the G was the only one that wouldn't come in. I was using an old Peterson tuner that has LED's traveling left to right if sharp and right to left if flat. Cool old machine! 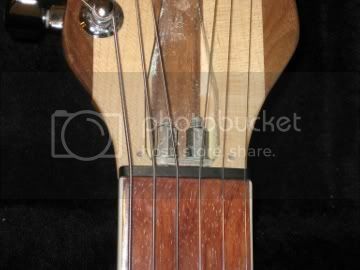 You need at least a little bite on the truss rod nuts or you may have an ugly intermittent rattle. Just add a split-ring lockwasher available at any hardware store between the nut and the rod so at least the nut will not float and buzz. Your big-E clearance should be a little more than the small-e all along the neck. 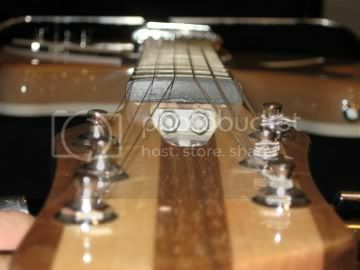 Typically the G-string really has to be stretched and the nut cavity cleaned with fine sandpaper moistened in alcohol. 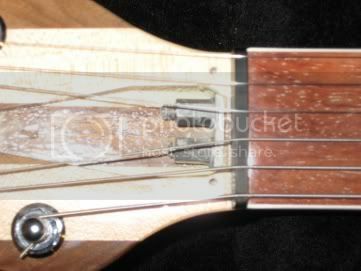 Then a drop of graphite in the slot will also do wonders, because the D & G strings have to do a relatively sharp bend at the nut, which can be a binding point. You have to get the tuning 1000% reliable before you try intonation. If you search for G-string problems, you will come up with lots of posts across the entire guitar world. Thanks much for the tips! Link doesn't work but I was able to see some of their products. Appreciate all the replies. A millimeter is way to much relief for a pro set up - on any guitar. A relief on a millimeter will make the guitar stiff and hard to play - and make it impossible to set up a nice smooth action too.